Managing files on hard drive and make it available for a longer period of time could be a daunting task. Unattended circumstances and minor mistakes could leads to system malfunctioning along with temporary data inaccessibility or sometimes permanent data loss. There were list of tools which could provide data safety guarantee and promises to recover user important files in cases if it’s lost or infected (PC Infection case). 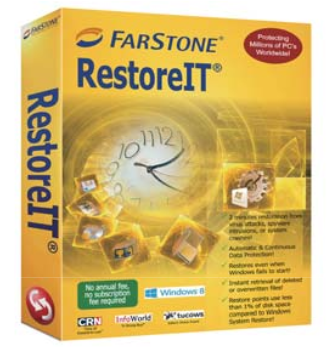 RestoreIT® 2013 from FARSTONE serves as a complete data protection utility and backup/restoration software, which offers far easier way of managing your PC and fight well against virus infection circumstances. Snapshot, also known as Restore Point is used to get frequent records (take not more than 5 seconds) of any modification around the hard drive storage area without affecting system performance. All snapshots were stored in software offered protected area or so called virtual partition where storing frequent restore point of changes on hard drive is easier and doesn’t affect the system performance. The idea of restoration works quite similar as Windows restore utility does and completely roll back your PC to previous successful running state. For example, if anything goes out of control or windows behaving abnormally, you’ve the full capability to roll back or restore hard drive sectors to its previous state. The whole process will take not more than 60 seconds and any virus/malware will be also removed from the system which weren’t existed previously. This process will help user to restore files which were accidentally deleted, modified or might lost otherwise, through restoring the snapshot created previously. 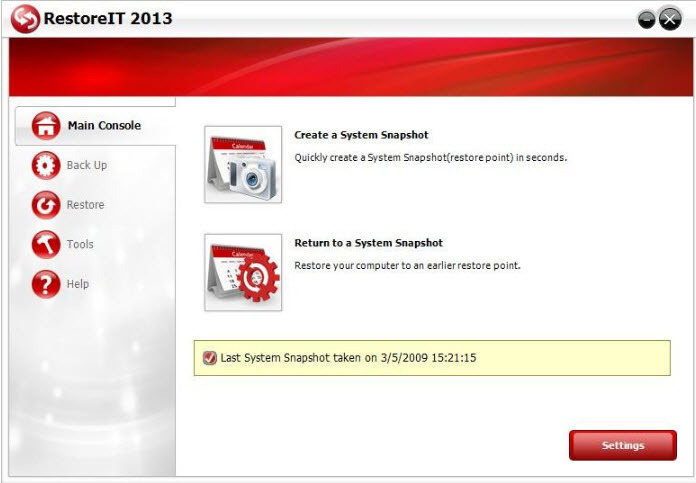 Besides providing frequent snapshot creation and recovery environment, the software has some useful inbuilt utility added in the latest version of this software, RestoreIT 2013. Support latest Windows operating system i.e. Windows 8 and Now finally tested on Windows 8.1. We’re tested this product on the preview version of the Windows 8.1 and it works flawlessly without lacking anywhere. Automatic snapshots followed by any unique even taken occurs on the system such as program removal/installation, files added/deleted or system get infected to virus/Trojan. You could see notification at the bottom left corner of the computer screen just after the unique even happens. The software keeps spy eye on the system performance and itself optimized to have minimal to no effects on system performance. Supports computer based on UEFI (Unified Extensible Firmware Infection), a unique technology that provides protection against boot sector infections. Also supports GPT portioned disks. The software brings some unique capability to users that is hard to find at one place at a fair cost, around $44.95 for a single license. Taking snapshot is a kind of pretty new technology and works pretty well on the latest Windows PC. Taking snapshot of your system is easier and recovering files is easier too than we thought that it would. Definitely, you can’t overlook this software if wants to find something great that become a helping hand in your bad situations. I love this easy and fast snapshot solution! Thank you for the info. I have been looking for a product like Restoreit for a while. Gonna test it. Sam! Best restore program ever!!! Best support ever!!! One click recovery without having to get into the operating system!! !